It takes off like a helicopter, then tilts 90 degrees and flies like a plane, using a single rotor blade. Because of that, it is light weight and can fly long distances. 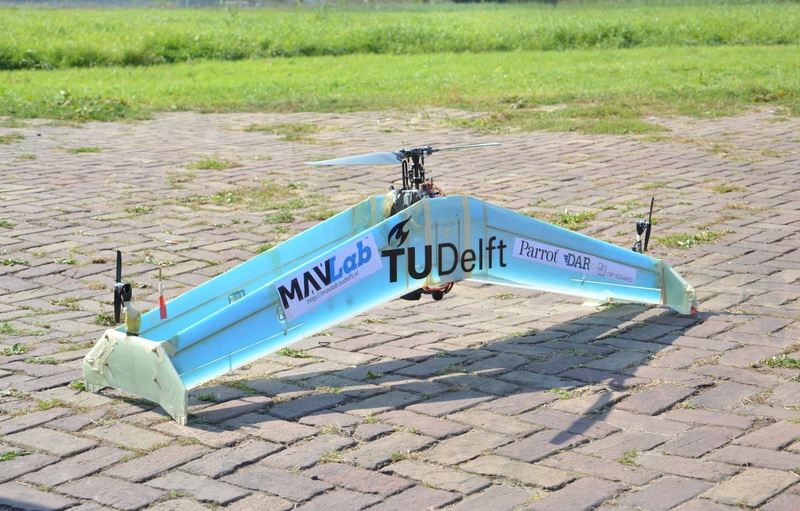 Meet the delftAcopter: a new autonomous hybrid drone, developed in the MAVLab of Delft University of Technology. This revolutionary drone can, for example, be used for search and rescue missions at sea. At the end of this month, the delftAcopter makes its debut at the UAV Outback Challenge in Australia. The MAVLab may be famous for the Delfly, but a lot research is being done on hybrids as well, tells project coordinator Bart Remes. He runs the team of researchers that developed the delftAcopter. 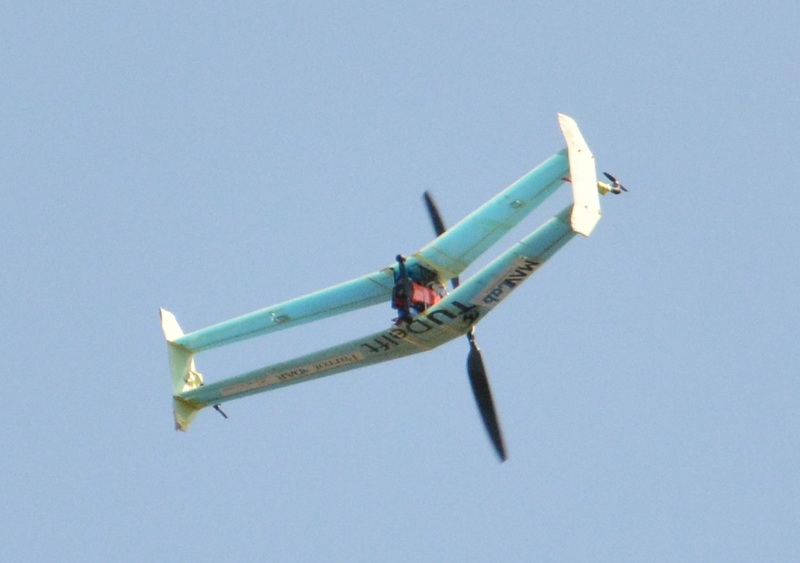 “Building hybdrids, a combination of planes and helicopters, is much more challenging than what is more often used: quadplanes.” Quadplanes are airplanes which can take off vertically due to the use of extra rotor blades. But they don’t have to tilt their air frame in mid-air, which is much more difficult in terms of the autopilot, software and control. "Building hybdrids, a combination of planes and helicopters, is much more challenging"
The delftAcopter is a biplane aircraft: it has a double wing to limit the influence of the wind while taking off and landing. It has a single big rotor blade for propulsion and two small rotors for stability. The wing span is about 1.60 metres, it can fly about 100 kilometres an hour and has a range of 60 kilometres. The drone is equipped with GPS and the latest on-board video techniques, so that it can fly autonomously. Remes and his team worked on the delftAcopter for a year. “We use the same propeller for hovering as well as the forward flight"
The drone will be put to the test during the UAV Challenge in Australia. The mission is to pick up a blood sample of ‘Outback Joe’, who has been feeling unwell and needs medical attention. His doctor has requested a blood test, but he is isolated because of a flood. So a drone has to pick up the blood sample Joe took from himself. During this Medical Express Challenge, the drone has to take off vertically, then fly 30 kilometres and land vertically 30 metres from Joe – but not closer. When Joe has put his blood sample in the drone, it has to take off vertically again and fly back to base. The drone has to do all of this autonomously and must complete the task within one hour. Next "Delivering on the promise of robotics"